Country Music Hall of Fame member Harold Bradley has passed away at age 93. A veteran session guitarist in Nashville’s renowned “A Team,” Bradley is believed to be the most recorded instrumentalist in history. He was Music Row’s unofficial historian and was the long-tenured president of Nashville’s Local 257 of the American Federation of Musicians (AFM) union in 1991-2008. He and his older brother Owen Bradley (1915-1998) built The Bradley Film & Recording Studios in 1954. Popularly known as The Quonset Hut, this was the first entertainment business on what later became known as Music Row. 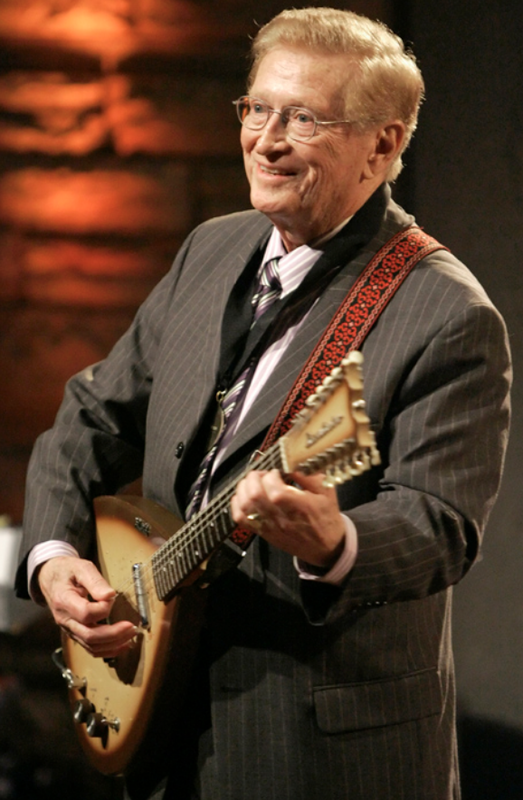 In addition to his 2006 induction into the Country Music Hall of Fame, Harold Bradley and other members of the “A Team” were made members of the Musicians Hall of Fame in 2007. He was honored with a Trustee Award at the Grammy Awards of 2010. Born in Nashville in 1926, Harold Bradley was urged by keyboardist Owen to switch from playing banjo to the guitar. Owen also got his younger brother a job playing in Ernest Tubb’s band in 1943, when Harold was still a teenager. After serving in the Navy during World War II, Harold returned to his hometown. While majoring in music at Peabody College, Harold Bradley played guitar backing such stars as Eddy Arnold and Bradley Kincaid at the Grand Ole Opry. His first recording session was in Chicago with Pee Wee King & The Golden West Cowboys in 1946. Harold Bradley was one of the people who established Nashville as a music center. He and Owen both played the first recording session held in The Castle, Nashville’s first recording studio. It was a 1947 ad jingle for Shyer’s Jewelers. In 1949, Harold played on Nashville’s first country million-seller, Red Foley’s “Chattanoogie Shoe Shine Boy.” In 1950, both brothers performed on Nashville’s first television broadcast. During the next 60+ years, Harold Bradley’s recording-session work included backing Elvis Presley, Brenda Lee, Buddy Holly, Roy Orbison, Jerry Lee Lewis, Clyde McPhatter, Ruth Brown, Carl Perkins, The Everly Brothers and several other members of the Rock ‘n’ Roll Hall of Fame. It would be easier to list the country stars he hasn’t backed than those he has. Among the Country Music Hall of Famers he’s on records with are Arnold, King, Tubb, Foley, Hank Williams, Tammy Wynette, Loretta Lynn, Ray Price, Patsy Cline, Jimmie Davis, Webb Pierce, Jim Ed Brown, Don Gibson, Jim Reeves, Chet Atkins, The Statler Brothers, Bill Anderson, Kitty Wells, Charley Pride, Tom T. Hall, Conway Twitty, Roger Miller, Willie Nelson, George Morgan, Marty Robbins, Lefty Frizzell, Faron Young, Hank Snow, Floyd Cramer, Bob Wills, Dolly Parton, Carl Smith, Johnny Cash, Hank Thompson and Sonny James. He was also a record maker, himself. Signed by Columbia Records as its answer to RCA’s Chet Atkins, Harold Bradley recorded Bossa Nova Goes to Nashville (1963), Misty Guitar (1964) Guitar for Lovers Only (1966) and the compilation Guitar for Sentimental Lovers (1972) for the company. His recorded work led to a ciitation form Billboard as one of 1964’s most promising artists. Harold Bradley was also a member of the recording group The Nashville Guitars. As a record producer, he worked with Mandy Barnett, Sandy Kelly, Eddy Arnold, Slim Whitman and Billy Chinnock, among others. Although closely associated with country music, Harold Bradley’s recording resume is impressively diverse. He has backed Ivory Joe Hunter, Patti Page, Brook Benton, Connie Francis, Ann-Margret, Burl Ives, Leon Russell, Bobby Vinton, Al Hirt, The Four Aces, Paul Anka, The Newbeats, Robert Mitchum, Michael Nesmith, Tom Jones, Pete Fountain, Henry Mancini, Joan Baez, George Beverly Shea, Damita Jo, Boots Randolph, Perry Como and more. In addition to guitar, he played “tic-tac” bass, banjo, vibraphone and percussion on various sessions. The Music Row founding figure was also TV musical director and in 1965-66 was the first president of the Nashville chapter of NARAS. He won the Recording Academy’s Superpicker Award every year between 1974 and 1979. The AFM gave him its Lifetime Achievement Award in 2006. On January 25, Belmont University announced a guitar scholarship had been established to honor Bradley. Harold Bradley died peacefully in his sleep during the early morning hours of Jan. 31.